01 In the kitchen, blend the beef mince gently with the suet and a little salt and pepper until well combined. 02 Divide the minced beef into 8 balls weighing around 120g each. Next, using the ¼ lb setting on the Weber Burger Press, shape your patties. 01 Fill a Weber chimney starter to the top with Lumpwood charcoal and light. 02 Once flames are licking through the top of the chimney starter, pour the fuel out covering just one-half of the coal grate. This is to create a safety zone of indirect heat for your burgers. Replace the cooking grate, close the lid and allow your kettle barbecue to preheat. 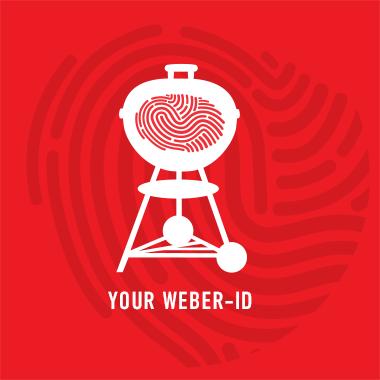 03 If you’re using a gas barbecue, light the left hand two burners, leaving the right hand burner off to create the safety zone. 04 After the burgers have chilled, season them generously with salt and cracked black pepper. 05 The burgers are now ready to grill. Place them directly onto the cooking grates over the lit fuel, replace the lid and allow them to grill for 2 minutes. 06 Before turning, check to see if the burgers will self-release from the cooking grate. If they do, then flip. If they are stuck they may need a little more time until they release. Allow the burgers to cook for a further 2 minutes before sliding them across to indirect heat. 07 At this point add a slice of cheese to each burger before replacing the lid. This will enable the burgers to fully cook through, eliminating any risk of burning. 08 Use an instant read thermometer to ensure a core temperature of 70°C has been reached. Remove and rest for a couple minutes while you prepare the bun and garnish. 09 Lightly toast the underside of each half of the bun, remove then build your burger. Serve with chopped iceberg lettuce, sweet onions, pickled gherkin and ketchup.